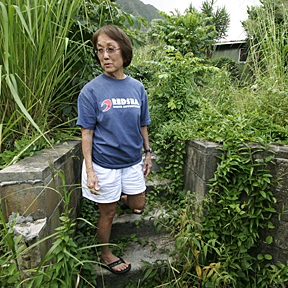 Earline Nakamoto talked yesterday about the land-slippage problem near the drainage area around Pilina Place, Pilina Way and Kupohu Street in Kaneohe. Because of the problems, the city will probably tear down affected homes. Nakamoto stood on some steps that lead nowhere, as the house that once stood there has been torn down. The state wants to tear down homes because of chronic flooding. Dior works fast on a show featuring Japanese icon Rinka. The quarterback looks forward to playing in the high altitude and low tempuratures of Reno. However, house and condo sales slipped in October from last year. Rep. Ed Case is asking the Bush administration to remove diplomatic and bureaucratic barriers to tourism from China.